Since its inception in 1973, approximately 100,000 professionals have pursued the CPIM®, making it the most recognized of all the certifications to be considered and it is the measurement criterion for professional competence in manufacturing and control. In the CPIM® program, participants learn to improve all functional areas of the enterprise. Employees build their skills and knowledge in materials management, while companies build leadership and increase profitability. Getting maximum performance from systems and technologies. For a detailed layout of each of the five modules – please click on the PDF. As noted above, the CPIM® covers a wide span or disciplines in the SCM arena. In the past, SCE has had participants from such key areas as operations, forecasting, sales/marketing, inventory management, scheduling, procurement and warehousing. Any participant that is working in any one of these areas or is desirous of moving into one or more of these areas would be ideal for this program. After participating in the SCE e-Learning programs, all that is required to become a CPIM® is to pass all five exams as noted above (minimum score of 300). Testing is based on exam windows. For exam registration, membership info and the window dates, please contact APICS directly at: 800-444-2742 or 773-867-1777. 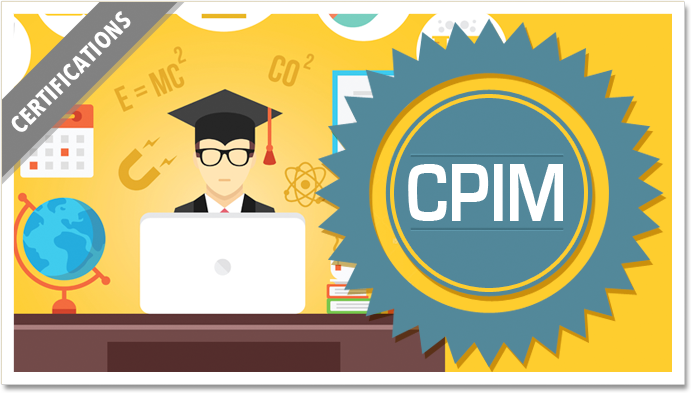 From the date at which you are CPIM® credentialed, you are required to obtain 75 hours of training over a five year period. This must be done for each five year period. SCE offers and assortment of affordable online courses to meet this objective. Please click on the Courses tab for more details.